Does this report mean it’s time to get more excited about renewables training courses? Should I invest in a Renewables? Should enrol on a Renewables training course? This is a question both home owners and engineers are asking themselves. We are living at a time when green energy is on the rise but still no where near where it should be. A new report from CEBR (The Centre for Economics and Business Research) has shown that bold government action to back British solar could create 60GW of generation capacity by 2030, enough to power the equivalent of 18 million homes. This in turn, would create around 50,000 jobs across the British solar chain. 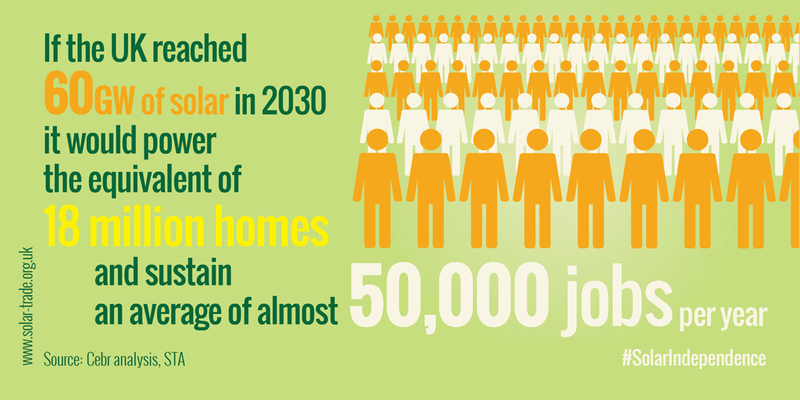 The report assumes solar farms would account for one third of total solar production by 2030. When the remaining two thirds on domestic and commercial rooftops are considered, STA estimates the benefits to the UK are as much as 3 times greater. The UK solar industry has delivered dramatic cost reductions since 2010. The solar industry’s reliance on subsidy has plummeted 65% in the last four years. This is expected to keep falling as the technology improves. British efficiencies in operation and installation, over and above falling manufacturing costs, are an increasingly important driver of falling cost. The average UK solar farm installation is 62% reliant on British components, operations and expertise, and this is forecast to rise to 71% by 2030. The report reveals that, with stable policy, large-scale solar was on course to become the cheapest way to add new UK electricity generating capacity, cheaper than constructing new gas (CCGT) by 2018 and the cost of solar was set to fall beneath the wholesale electricity price by 2024. Today, Britain’s solar industry warned Government that its unreliable, unstable treatment of the solar sector risks slamming the brakes on its journey to cost competitiveness, costing consumers more and handing the advantage to Germany and Italy in the global export market. The Government’s unstable support for solar is already starting to impact with almost half of all large-scale solar companies stating they expect to decrease staff over the next year. Drive a stable transition away from subsidy, by setting clear Renewables Obligation support for the next two years. Unlock the vast potential of the non-domestic rooftop solar market by reviewing feed in tariffs for larger projects, which aren’t working. Give solar a bigger share of the levy control framework, recognising that this is the fastest way to help the industry stand on its own two feet. From playing barely any part in the energy mix four years ago, British solar now produces 5GW of electricity, equivalent to power 1.5m homes. Britain has propelled itself to the front of the global solar race. The UK is one of the world’s top ten solar markets, and Britain now produces more power from the sun than Spain. The British solar industry is composed of over 2,000 SMEs, supporting 16,000 jobs. British companies are beginning to export their expertise overseas, looking to Africa and Asia to capture a global market expected to be worth £130bn by the end of the decade. Growing solar power is the most cost effective way of reaching the UK’s ambitious climate change target of an 80% reduction in greenhouse gas emissions by 2050. Solar is already cheaper than offshore wind, and, with stable support, will soon outcompete onshore wind. In May 2014, DECC suddenly and unilaterally announced plans to end the subsidy programme for large scale solar two years ahead of schedule. The Solar Trade Association has warned that this will damage the industry and harm Britain’s chances of global competitiveness. Four solar companies are challenging DECC’s decision in the Courts. If you would like to learn the skills to work on domestic solar installations and other renewables, have a look at our Renewable training courses.